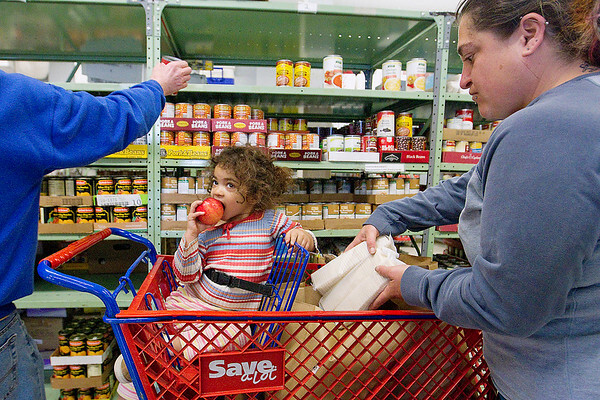 Nikola Swenson and her daughter Phenyx DeLoatch, 3, visit the Father Fred Foundation food pantry while a volunteer stocks the shelves on Thursday in Traverse City. A recent report from United Way shows a number of Grand Traverse area residents at or below the ALICE (Asset Limited, Income-Constrained, Employed) level, meaning those families are above the poverty level but struggle to cover the areas cost of living expenses. The Father Fred Foundation Food Pantry is one of the organizations receiving funding to help those people caught in that situation.